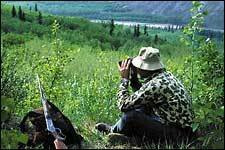 / What Rifle is Best for Bear Hunting? 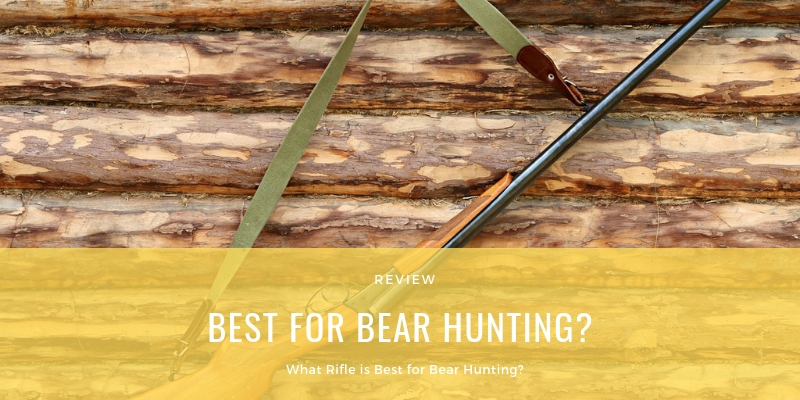 What Rifle is Best for Bear Hunting? Scrambling hard and fast, I’d managed to get ahead of the bear, and now he was slowly making his way in my direction. Cover and terrain hid him from me for long seconds, and my palms sweated as I gripped the rifle, waiting. Then he was there. Not just close enough, but too close. I raised the rifle, saw little more than fur in the scope, and squeezed the trigger . . .
What kind of bear? What was the terrain like? Was it a big bear? The scenario above has happened to me three or four times. Once it was with a large brown bear in snow-covered alders; several other times this has happened with black bears in areas as diverse as North Carolina and Alaska. The bear was feeding in a little clearing on a brushy hillside. We’d glassed him from afar and had the drop on him, but the brush and terrain were such that a 200-yard shot was the best we could do. I set up my daypack over a handy boulder, laid the rifle across it and took some deep breaths while I waited for the bear to turn. When the shot looked right, I squeezed the trigger. This second scenario has repeated itself with Alaskan brown bears, mountain grizzlies and quite a number of black bears. For various reasons, a steady, deliberate shot at 200 yards seemed the right thing to do. There are two important points here. The main one is that, regardless of which bear you are hunting or where you are hunting him, it is difficult to predict exactly what kind of shot you will draw. You need to be ready for anything from a fast shot at bayonet range to a precise, deliberate shot at something beyond 200 yards–or anything in between. The other important thing is that, with minor variations, the two opposite scenarios described above accurately describe circumstances under which I’ve taken two coastal brown bears, two grizzlies and at least eight black bears. In other words, the prospective bear hunter should be prepared for either extreme. These two scenarios combine genuine incidents with about a dozen different bears, and in all cases I was successful. Not all resulted in one-shot kills, but in no case did we have to chase a wounded bear. I have also taken a lot of bears in the “middle ground” between, say, 50 and 175 yards–and in that middle ground I have screwed up, sometimes badly. But at the two extremes, very close and much farther out, I have been quite successful. This suggests I have used rifles and cartridges that would handle any shot I might encounter, and that’s really what selecting guns and loads for game is all about. Bears, all bears, are powerful animals that demand your respect, and since big bullets just plain hit harder than smaller bullets, that’s the way to go. We tend to dwell on foot-pounds when considering a cartridge’s suitability for game. But bears, like Cape buffalo, don’t understand foot-pounds of energy and aren’t particularly impressed by them. Any bear, is an extremely powerful animal whose vitals are well-shielded by tough hide, corded muscles and heavy bones. The problem multiplies exponentially as bears get bigger, so you must use bullets that are tough and will penetrate without fail. The only way to kill a bear is to place the shot so that it will do extensive and irreparable damage to the heart, lungs, spine or brain. Because of this, I believe in fairly large bore diameters and heavy-for-caliber bullets. If I were to quantify “bear medicine” in terms of foot-pounds, I would rate black bears about the same as elk: I want a good 2,000 ft.-lbs. of energy. On the largest bears, 3,000 ft.-lbs. is a good number–provided you place your shot and use a proper bullet. I’m still haunted by the handful of lost-game incidents I’ve experienced in my career, even though a couple of instances go back 30 years or more. I can relate two instances of wounded and lost bears. One was not mine; the rifle was a .270, the bullet a 150-grain conventional softpoint. The presentation was straight broadside, and through the binoculars I saw the impact on the shoulder. From the bear’s reaction, and the trail we followed until it ran out, the only possible conclusion is that the bullet failed to penetrate the heavy shoulder bones. The second instance was mine. I shot a huge brown bear–supposedly on the shoulder–with a 180-grain X-Bullet from a .300 Win. Mag. The bear instantly lurched into the brush, and we followed an ever-diminishing spoor for eight hours, failing utterly when we tried to pick it up again the next day. There are lessons here, but don’t take home the wrong ones. In the first case, the .270 will surely kill black bears, and the 150-grain bullet is the right weight–but on bears you’d better make it a premium bullet that will surely penetrate: Fail Safe, Barnes X, Trophy Bonded Bearclaw, Swift A-Frame, Nosler Partition and the like. In my own debacle, the .300 Win. Mag. was enough gun, and the Barnes X was surely enough bullet. The simple answer is that I flubbed a simple shot. It is almost certain I didn’t hit the bear where I thought I did because he was seen the next season hale and hearty. I will always wonder if a bigger rifle like a .375 might have dealt a heavy enough blow to give me time for a second shot, but the fact remains that a bigger gun won’t help if you miss the mark. Versatile, dependable cartridges such as (from left) 7mm Rem. Mag., .30-06 and .300 Win. Mag. will work for all black bear hunting. You want plenty of power behind good bullets, and in most situations you also want versatility. The big bears–brown/grizzly and polar bears–are properly considered dangerous game. Black bears are borderline, but far more people are mauled by black bears annually than by all the rest combined. With any bear it is essential that you be able to stop the animal at close range, whether in a chance meeting or a genuine charge. But it is also desirable that you be able to reach out at least 200 yards, preferably 250 yards, because that might be the only opportunity you have. This business of reach is actually a dual requirement. First, the cartridge should be flat-shooting enough so that you can make a shot at medium range without worrying about holdover. Second, the cartridge must have enough power so you still have all the energy and penetration you need when the bullet gets there. There are at least two common exceptions to this versatility business: black bears over bait and hunting with hounds. In the former, you can forget about 200-yard shots–most stands for rifle hunting are sited 50 to 100 yards from the bait. Baiting is usually done in timber, so unless the first shot immobilizes the bear, he can vanish before a second shot is remotely possible. Of course, black bears are most likely to come to the bait in the evening, and the biggest bears will usually appear very late, in poor shooting light. All of this points to a rifle that will thump a bear really hard, and this is a perfect place for a powerful “brush rifle” like a Marlin in .45-70 or .450 Marlin, or a Marlin or Winchester 94 in .444 Marlin. Hunting behind hounds is a different game. The chase will often take you through some of the steepest and nastiest country around, so gun weight and handiness are factors. When the bear is bayed or treed, the shot will almost always be at short range, but it’s essential that the bear be taken as cleanly as possible to prevent injury to the dogs. The classic houndsman’s rifle was the short, light, vicious-kicking Remington M600 in .350 Rem. Mag., discontinued many years ago. Other good choices include lever actions from .35 Rem. upwards, and this would be a good place for Ruger’s slick little .44 Mag. carbines in both lever action and semi-auto. For all-around use on black bears, I still like fairly heavy calibers and heavy bullets, but I want a bit more range. My preference is medium-velocity .35 calibers. The nearly obsolete .358 Win. in a lever-action Winchester 88, Browning BLR or Savage 99 is good; when zeroed correctly, it will do just fine from the muzzle out to 250 yards or so. However, the .350 Rem. Mag. (also almost obsolete) and the .35 Whelen are superior. Fortunately the Whelen is both popular and available, and I rate it as one of the best black bear cartridges in the world. This year, Weatherby will be producing the first factory rifles in the .338-06, long a popular wildcat, and this will be another excellent black bear cartridge. There is nothing wrong with using your favorite deer rifle chambered to something between .270 and .30 caliber. I tend to lean toward the .30s, but a .270 or a 7mm will cleanly take bears. When you go lighter in caliber you must be even more careful to choose good, tough, heavy-for-caliber bullets that will penetrate. Round-nosed bullets initiate expansion and transfer energy far more rapidly than spitzers, and at closer ranges their ballistic inferiority isn’t important. If I were using a .270 on black bear I’d choose a tough 150-grain round-nose bullet. 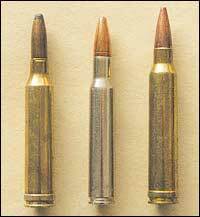 In the 7mms, use bullets from 160 grains upwards, and in the .30 calibers consider 180 grains the minimum weight. Most bear hunting is down in relatively close cover, where trajectory isn’t critical. Here’s where power and placement come into play; you want to drop that bear quickly. Bigger isn’t necessarily better, but there is absolutely nothing wrong with fast .33s from the .338 Win. Mag. upwards. I’ve often used a .375 H&H;, and I’ve never been embarrassed about carrying such a large rifle. In one of the close-encounter scenarios mentioned at the beginning of this story, I was using my 8mm Rem. Mag. ; in another I was using a .375 H&H. ; Neither instance was exactly a charge or an attack, but in both situations I shot monster black bears right off the end of the rifle barrel–and I was thankful I had plenty of gun in my hands. When I talk about cartridges for black bears, I’m always thinking about the kind of bear I hope to encounter: a bear weighing a quarter-ton or more. All bears are tough, but a 500-pounder is in a whole different class from the average bear, which will weigh closer to 200 pounds. The potential for a really big bear exists wherever black bears are found, and a monster black bear will outweigh the average interior grizzly. Of course, grizzly bears get a whole lot bigger, and salmon-fed coastal brown bears and polar bears are larger still. Few brown bears are ever weighed, but I am absolutely certain that a really big one will go a good 1,500 pounds. Shot placement remains the most important issue, but I think a .30-caliber firing a good 200-grain bullet is absolutely minimal. 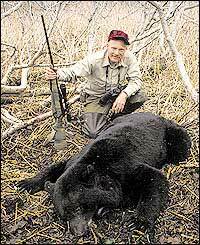 I can assure you that I will never again hunt a big bear with a caliber as light as .30. Good choices start with the 8mm Rem. Mag. and work their way through the magnum spectrum to about .416. I think cartridges such as the .338 Win. Mag., .340 Wby. Mag. and .338 Rem. Ultra Mag are perfect for grizzly bears. Interior grizzlies are smaller than coastal bears, and the terrain often results in longer shots. Further, inland bears are far more thinly distributed than coastal bears, so while long-range shooting is not recommended, you want to be able to take any sensible shot. My last grizzly was killed on the final evening of the hunt, cross-canyon at about 250 yards; a 250-grain Nosler from my .340 Wby. Mag. flattened him. The fast .33s are also good medicine for brown bears. Another of my close encounters was a Kamchatka brown bear that emerged from snowy alders at less than 60 yards. The same load from the same .340–just one–handled the situation perfectly. Even so, I lean heavily toward the .375 for the very largest of bears. The .375 H&H; is the traditional choice, but it’s hardly the only .375 out there. Faster cartridges such as the new .375 Ultra Mag and Weatherby’s soon-to-be-reintroduced .375 Wby. Mag. offer a bit more versatility without an inordinately high price in recoil. There is simply no such thing as too much gun when hunting the biggest bears; many Alaskan guides carry .458s (and larger) with no apologies. However, there’s a difference between hunting a bear and preventing the escape of a wounded bear or stopping an attack. My idea of the ideal “big bear rifle” is bolt action, chambered to anything from a fast .33 to a .375, in either synthetic or laminate stock.